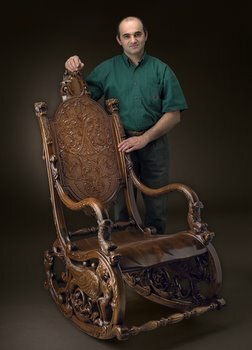 Boris Khechoyan, also known as the Master Woodcarver, had humble beginnings in Baku, Azerbaijan. There he began developing his artistic abilities at the Azerbaijan College of Fine Arts in 1978. Since then, Boris immigrated to the United States and launched his successful career as an expert woodcarver and teacher. He specializes in Gothic, Rococo, Empire and Classic woodcarvings and incorporates his own style and creativity into his pieces. Boris gained national media coverage for his hard work. Read on to find out more about this unique artist. Q. Hello Boris. Thanks for talking to us about your artwork. 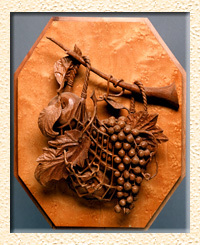 How did you get involved with woodcarving? When did you realize it was your life's passion? A. In the beginning it was just a hobby. In college, I decided to study woodcarving just to create something nice for my home, family, and friends. Then I realized I couldn’t stop carving. I knew it was my passion when I could carve all day and night without getting sick and tired of it. I had to force myself to go to sleep. Every day I had more and more ideas for future projects. I went to an Architecture University to learn how to design different periods and styles, not to become an architect. Q. What makes your work different than other woodcarvings? How is it unique? A. I’m always trying to design and carve projects as challenging as possible. I try to do the even simplest work, museum quality. Most of my art projects I do for the first time, they’re one of a kind, and difficult to copy, even for me. Q. You craft everything from furniture to religious pieces to abstract art. What type of piece is your favorite to work on and why? A. My favorite piece to carve is furniture because I like to add a lot of artistic details, like it was done in the 17th -19th centuries. 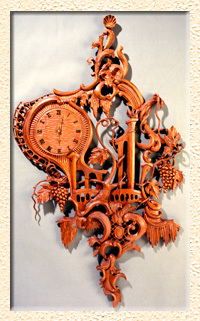 Also I like to carve my own design art—clocks, landscapes, plaques, by adding grapes, grapes leaves, scrolls, shells, and spider web elements. Q. Where do you draw your inspiration? A.Old masters, antique furniture, books, and museums inspire me. They make me want to create original pieces and reach the professional level. Complex work also inspires me. Sometimes I don’t envision the final project, and exactly that inspires me to work harder and spend more hours on a piece. At the beginning of my career giving presents and gifts to friends and relatives was inspirational. The motto of my family in regard of giving gifts is: “It’s more precious to give something you’ve made with your own hands, than to buy something at the store.” Surprising my friends and family with my work is a great inspiration. A. I’m happy that so many people want to learn to carve in class. The problem is they spend little time practicing on their own time. That’s something I seek to change and I enjoy seeing students advance. Q. Under what circumstances do you like to work in? Do you have a particular area where you like to go to finish your work or get any ideas? A. The best place for me is my shop. I get tons of ideas from looking through my art books. Those beautiful images inspire me and trigger my creativity. Q. Your work has been featured on HGTV, the Home and Garden Channel, as well as numerous magazine and newspaper articles. How has the positive publicity affected your business? A. Because of the publicity, more people know about my work. In time, they might call me for a project. Q. Have you been as successful in the United States as in Azerbaijan? A. I’ve had more success in U.S. than in Azerbaijan. This country has more opportunities and more possibilities. When I came to America, I realized that I was back to square one. I had to start from the ground zero. I didn’t know anything or anybody. I had to prove to the new world that I’m a Master Woodcarver and show them what I can do. I needed time and financial support to begin somewhere. In the meantime I worked in my basement and learned English. Perhaps my greatest honor came during Pope John Paul II's historic visit to St. Louis in 1999. I was asked by the Archdiocese of St. Louis to help restore pieces in the Archbishop's residence in preparation for the Pope’s visit. I fulfilled the request and also gifted a walnut hand-carved chair to the Archbishop's Residence for the Holy Father's visit. Q. 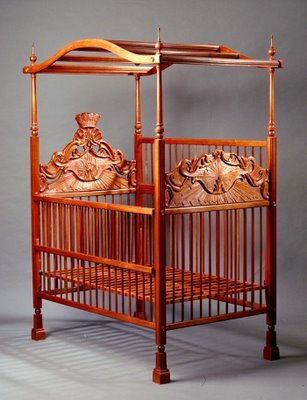 You've created a beautiful Mahogany baby's bed. What lead you to create this? Would you ever allow anyone to purchase this piece and what kind of artwork do you have to offer for kid's room decor. A. I’ve made this bed for my first-born son. This particular piece is being used for a decorative purpose. I will never sell it. I will make another one, custom made, very similar if anyone is interested to purchase one for a child. Sorry, this one is sacred! Most of the work I do is very custom, so parents that are willing to order expensive pieces for their kids rooms can choose from hanging wall pieces, carved clocks, or name plaques. Q. In what direction do you expect your business to go in the future? Is there any element you hope to expand on? A. I’d like to create different kinds of period furniture and spend more time teaching classes. I might decide to start producing limited edition “mass” production furniture. I’d also like to make more affordable hand carved furniture so more people can enjoy my art. Q. Do you take personal orders for your work? A. I do plenty of custom jobs based on customer ideas or mine. If you would like to have something similar handmade to your custom specification, contact Boris Khechoyan at Khechoyan's Carvings & Tools directly. Thanks again to Boris for this wonderful interview and we wish him all the sucess with his art and business this coming year.